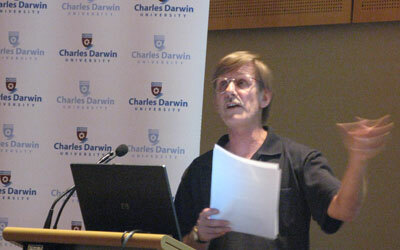 A leading researcher and author has challenged the origins of agriculture in Australia during a public lecture at Charles Darwin University’s Alice Springs campus. Mr Rupert Gerritsen (pictured) last week challenged the assumption that all Australian Aborigines were purely nomadic before the arrival of British explorers in the late 1700s. He presented evidence of Indigenous food production economies in Victoria, and the Channel Country of the South Australian, Northern Territory and Western Australia “corners” that had developed before the arrival of the first fleet. Mr Gerritsen’s presentation was part of the University’s ongoing public lecture series which aims to encourage broad debate in the Territory community. Of particular interest was his suggestion of Dutch influence in the agricultural practices of Indigenous communities in north western WA, occurring when Dutch sailors were dumped on shore after a failed mutiny. He further argued that some traditional Indigenous groups lived in large, permanent, highly sedentary villages in four examples across Australia. Mr Gerritsen’s research and role in the 2006 “Australians on the map” celebrations were recognised by the Dutch Government who made him a Knight in the Order of Orange-Nassau in October 2007, equivalent to the Order of the British Empire. His best known work is And Their Ghosts May Be Heard which detailed the fate of Dutch mariners cast away on the Western Australian coast in the 1600s and early 1700s. He continues to publish in the field of Indigenous history, linguistics and historical ethnography. His latest work on Neolithic economies in pre-British Australia will be published shortly. Mr Gerritsen presented at the invitation of his brother, CDU Central Australian Research leader Dr Rolf Gerritsen, who said it was symbolic for his brother to present his ideas in the centre of Australia. “There is a strong history of exploring Indigenous achievements and histories at CDU and Rupert’s work reveals the diversity and sophistication of Aboriginal cultures throughout the country,” he said. The CDU public lectures are part of the University’s commitment to community engagement and provide the Territory public with a platform for interesting debate across social, political and intellectual perspectives.